Exhibiting at congresses and trade shows is the perfect opportunity to showcase your latest product developments to the industry. But while some congresses are industry-leading, must-attend events, others are less clear-cut. When a congress ends, how do you decide whether it was worth the time and money invested in it? Should you book again for next year, or would you be better off increasing your presence at a different congress? We’re sharing how our customers use real data to get a snapshot measure of their event performance, instead of relying on gut feel when making events decisions. It can be difficult to get real, useful data to measure the success of a congress. For many exhibitors, their measure of a successful trade show is asking all their reps whether they felt it had been a good event. For many exhibitors, their events exist in a silo, completely separate from the rest of their sales and marketing activities. This means it’s difficult – if not impossible – to connect the dots, and track and attribute leads and sales to different events. Additionally, lengthy sales cycles make it even more difficult to measure event performance. Some of our customers have sales cycles that are two years’ long, meaning it’s impossible to calculate the ROI from your last congress before you have to book the next one. If you can’t use return on investment as the basis for making a decision on your next congress, what’s the alternative? There are other ways to assess the success of an event, other than attributing sales and calculating return on investment. When you’re under pressure to decide whether to re-book a congress for next year, you can’t wait months and months to calculate your return on investment from the last event. You need a quick way to measure success. From speaking to our customers, we’ve identified three common ‘snapshot’ metrics. Organisations can use these to measure their performance in the immediate aftermath of a congress or event. When it comes to your new business leads, are you getting good quality leads, or high volume, low value leads? While some organisations take the approach of collecting as many contacts as possible during a congress, focusing on quality conversations and collecting high-quality leads will be more valuable to your organisation. Many exhibitors use some sort of lead ranking system (1-5 stars, hot/warm/cold or similar), so it’s easy to assess overall lead quality after an event. If you’re looking for new business leads from a congress, knowing the proportion of new leads vs. existing customers can help you assess whether the event met your expectations. You don’t want to invest all your budget exhibiting at an industry-leading congress, and come away with just a tiny number of new business opportunities. Since GDPR came into force, exhibitors and event organisers alike have had to re-think the way they collect and process leads from events. Congress visitors now have much more control over how their contact details are used – such as being able to opt in or out of follow-up communications. If you’ve had a congress where a lot of visitors have opted out of follow-up communication, this suggests that the show was a poor fit for your organisation or product offering. Want to learn more about post-trade show reporting? Listen to The Big Event podcast. 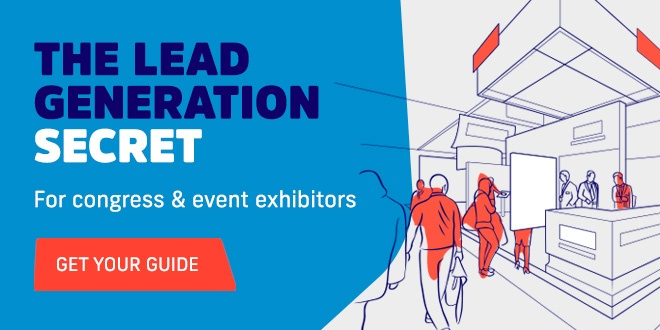 If exhibiting at events, congresses and trade shows is a crucial part of your face to face marketing strategy, improving your lead capture process can give you a real edge over the competition.